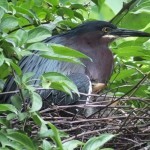 Green herons are nesting on the lullwater and near the less-fancy bridge by the boathouse. Green heron on nest by the boathouse. Babies are tucked under her wing. Green heron feeds her creepy-looking babies. Swans in the park, as if in defiance of a potential plan to wipe them out, are multiplying. They have two nests, one helpfully placed on an island by the ice rink to make for easy viewing. The father swan normally spends his days chasing off other waterfowl, but he came and sat on the eggs with his wife. Apparently he was alarmed by a mommy mallard and her ducklings nearby. I havent’ seen barn swallows build nests on the boathouse yet, just in the tunnels. 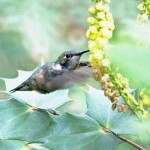 In the last week hummingbirds flew into IL, NY, PA, OH, MD and even Ontario, way ahead of schedule. Freakishly, many fragile hummingbirds spent all winter up north.